Pop*POP*poP*Pop! It's not the sound of bubble wrap, but it is equally as exciting! 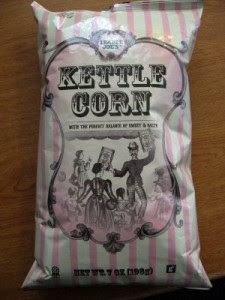 TJ's just came out with LITE Kettle Corn. Personally, the name should be called Heaven Corn for 3 reasons: (1) sweet & salty & guilt-free, 110 calorie servings with 50% LESS fat than the original (2) the fact they are the what clouds would taste like if you could eat them: light and crunchy (3) the inventor clearly has omniscient powers. Okay, now that we've got that straightened out, lets discuss the logistics of this wonderfully delicious treat when you check out-- you MUST put this item on the very top of your bag for 2 reasons: (1) easy access for munching on the ride home (2) like eggs, they are best when not squashed. If you buy 1 bag, you will be upset. No one goes golfing with just one golf ball. You take at least 6, just in case someone borrows one, you loose one, you save one...etc. I've said all I can on this topic. Now please follow the light and go pick up some Heaven Corn.